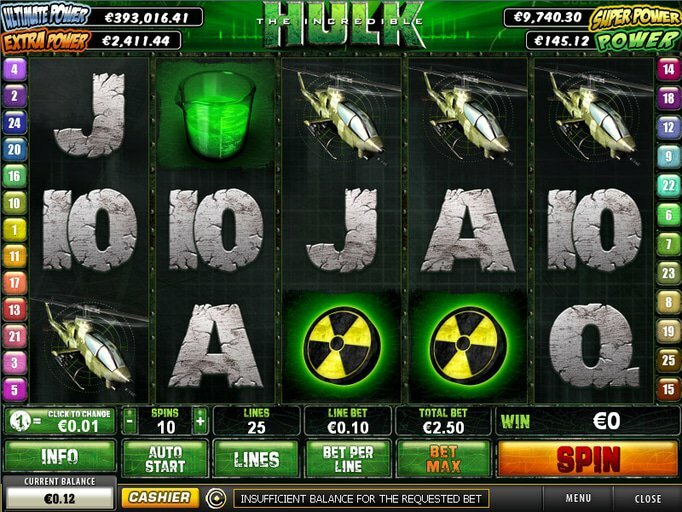 The Hulk slot machine from Playtech features five reels and 25 paylines full of fun. There is a green and stone dynamic theme here which fits in nicely with the original comic, and since it is one of the Marvel slots, it is part of a nice progressive jackpot that is randomly triggered with any size wager. You'll see police cars, helicopters and even radiation symbols on the reels accompanied by poker symbols 9 through Ace which are constructed from stone. The maximum in-game jackpot is $80,000 and you'll be able to choose wagers starting at a penny and climbing to $500. The first noteworthy feature to mention here is the wild which is the Hulk himself. He'll expand to fill the entire reel if he lands in the center - or when he is found on the second, third and fourth reels all at the same time. When he's only in the center, he'll hold that reel in place and spin the rest twice to help you rack up the cash. If he appears on all three, though, he'll only re-spin them for you once. The scatters are the Title Logos and these will provide you with 10 free spins during which all wins are tripled. Finally, there's the Hulk Smash bonus which is triggered when you see the corresponding icons on the first and last columns at the same time. You'll need to smash three cars to reveal your instant win and then smash one of three helicopters to determine your multiplier. Once in a while, the random Rage feature will unlock and smash all seven cars at once; this is a great bonus that can really add to your bankroll. Of course, there are also the four 'Power' jackpots that are randomly triggered after any spin. If you get the chance to participate, you'll need to keep selecting from 20 hidden squares until you turn over three of the same icon. This icon corresponds to the tier of the prize that you will win. Overall, this is an exciting title and one that fans of Marvel comics are sure to enjoy. To check it out without having to worry about your budget, head on over to Bet365 Casino where you'll get some courtesy Hulk free spins. While you can keep what you win, you'll need to meet some wagering requirements first. Bet365 will even help you with this and give you a 100% deposit match worth as much as $200 when you enter the code BONUS100 at checkout.